Ambient Weather WS-1002-WIFI OBSERVER Review: Worth Your Money? >> Ambient Weather WS-1002-WIFI OBSERVER Review: Worth Your Money? Over the years, Ambient Weather has earned a stellar reputation for manufacturing excellent home weather stations. Now, it has released another exciting product called WS-1002 Wi-Fi Observer. This multi-faceted station can measure temperature, wind speed, humidity, wind direction, rain, UV and solar radiation from its multiple sensors. On top of that, it is also able to tell you about the inside barometric pressure, temperature and humidity of your house via its indoor temperature sensors. Another impressive feature of this solar-powered wireless weather station is that it connects via Wi-Fi and therefore allows you to read all the info on your phone or laptop. It also comes with a spectacular LCD color display to show you all the measurements. With Wi-Fi connection, you can directly connect to the ambient weather's Wunderground and share your weather data with others. Moreover, the indoor controls are compatible with both Google assistant and Alexa. And you get all these features at a relatively moderate price. The display of WS-1002 Wi-Fi Observer has a sleek design and shows you the colored set of data collected from the sensors. You can mount it on your wall or your desk easily. Moreover, it's smart enough to adjust its brightness depending on whether it's night or day. The interface of this 6.25 x 3.5” display is extremely user-friendly. It provides you with a lot of options. For instance, you can choose which data to be shown on the display and which are to be hidden. In that way, you can prevent your display from being cluttered with irrelevant data. We have reviewed a similar weather station here. Some weather stations require strenuous efforts for the installation process, which can make the experience extremely frustrating. Fortunately, the installation process of the WS-1002-Wifi is effortless. It comes with all the necessary accessories such as the extendable tripod, rechargeable batteries, and other mounting hardware. Hence, you can set up the whole system without breaking a sweat. The WS-1002-Wifi comes with an array of sensors. They can inform you of the subtle changes in the weather condition. It includes a thermometer, barometer, rain gauge, anemometer and other sensors. They take measurements of the temperature, wind speed, humidity, rainfall, solar radiation and the barometric pressure. For example, the thermometer has a temperature range of -40 °F-149 °F. Hence, it can accurately tell you about subtlest change in the temperature around your surroundings. It must be remembered that the sensors are exceedingly sensitive and need to be handled carefully. Thankfully, the weather station comes with a solar and UV radiation shield to protect the sensors. While installing, make sure that the shield is in place. The sensor array of WS-1002-Wifi is powered by solar panel. Unlike its predecessor, it has a super capacitor for energy storage. Moreover, it also includes a non-rechargeable battery for night time. That means you will be provided with weather data throughout the day. One of the most amazing features of this weather station is its dual wireless technology. The outdoor sensor array of this weather appliance connects wirelessly to its display and can also send weather data to your mobile via Wi-Fi connectivity. As the unit is Wi-Fi enabled, it can connect to the ambient weather's large network of home weather meters called Wunderground. As a result, you can transmit data to other people and at the same time receive important updates on the weather condition of different places. The WS 1002-WIFI also has the ability to connect with Alexa and Google Assistant. With the help of these smart-home hubs, you can now find out about the weather conditions by uttering just a few words. Another cool feature of this device is that it includes IFTTT, which enables you to connect with web services such as Facebook, Gmail, and Instagram. Moreover, if you don't wish to share your weather data with other people, then you can use the Ambient Weather Network to store all your data instead of sending it to the Wunderground. 1. 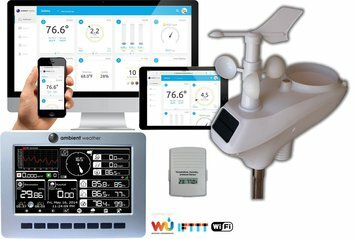 What are the differences between this weather station and the WS-1200-IP? Ans:They aren’t many differences between them. The key difference is that the WS-1200-IP uses a special transmitter to send data, whereas this one uses the console. 2. Does the unit come with any mounting hardware? 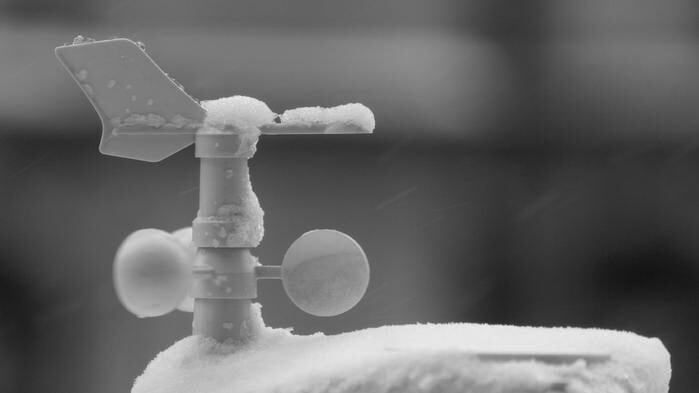 Ans:Yes, the weather station comes with metal clamps and a small connecting piece so that you could mount it on your own pole. 3. Can this weather station store and graph historical data and present conditions on my computer? Ans:Historical data can be downloaded into a program such as MS Excel and you can work with it there. Otherwise, you can use the Weather Underground site to display info on your pc or other devices. The Ambient Weather WS-1002-WIFI OBSERVER comes with all the features of a high-quality weather station. It also includes additional sensors, which you won’t get with other weather observers. The fact that it is compatible with Google Assistant, Alexa, and IFTTT is also a huge advantage. Moreover, it comes at a really reasonable price. Hence, in my opinion, it would be an amazing addition to any home and will certainly make you feel like a real meteorologist. Let me know what your opinion of this device is. I have had poor results with my WS-1200-IP weather station. The outdoor sensor array started to malfunction after only 1 year and 9 months of use. The manufacturer refused to warranty the product after 1 year, which is a violation of Maine Consumer Laws, and would not repair the unit. A device like this that is meant to be exposed to the elements year-round should not fail in such a short amount of time. The only option I was offered was for me to purchase a replacement outdoor sensor array. This is extremely poor customer service and I would not suggest that anyone purchase one of these devices. I order to obtain satisfaction, I have been forced to lodge a complaint through the Maine Attorney General’s office.